This charming set of Matryoshka nesting dolls mesmerizes the viewer by its unique hues and shades of live watercolors, inimitable author’s design and composition. 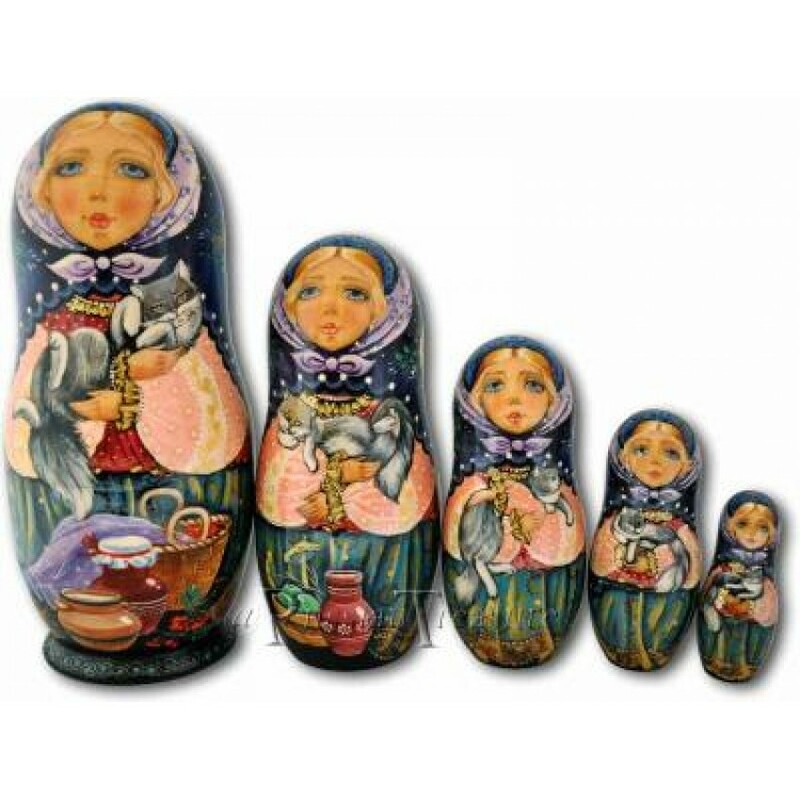 Each Matryoshka nesting doll is holding a foxy grey cat in her arms, with a basket and pots of milk and cream at her feet. The plot of the story depicted on these Matryoshka nesting dolls is quite simple and familiar – a crafty cat has sneaked into the kitchen to relish some milk and other goodies. And his mistress caught him red-handed. The girl, featured on these Matryoshka nesting dolls, is wearing a beautiful kerchief – lavender with navy blue, decorated with gorgeous misty roses and cobalt ornaments. The translucency of the veil, covering each Matryoshka nesting doll, is produced with the help of the skillfully applied lacquer, the effect that normally takes up to several months to achieve. The burgundy “yapancha” jacket of the Matryoshka nesting dolls contrasts the tender peach puff or her chemise, while the emerald green of her skirt makes a perfect finish to the whole blend. When looking for some special gift for your loved-ones, don’t pass by this set of cute Matryoshka nesting dolls – they will delight your eye for long years ahead, and warm up your heart with their unsophisticated yet delightful story. This one-of-a-kind set of Matryoshka nesting dolls can only be found here at Russian Treasure store.